Perfect for Oriental-style gardens and low-maintenance areas. 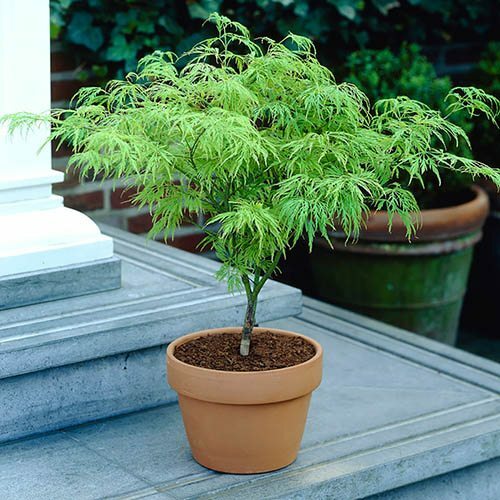 Fabulous lacy foliaged green hardy Acer (Japanese Maple) tree - ideal for small gardens in large pots. Slow growing and spreading habit, reaches 2m tall and 2.5m wide in 10 years. Lime green new leaves each spring, with amazing orange-red autumn blaze, before leaves fall each year. Very hardy and easy to grow - sun or light shade, in soil or large pot c. 50cm diameter. This delicate looking, lacy leaved Acer is a real garden classic - a compact and easily managed small tree, ideal for smaller garden borders as a specimen, or large pots, and works especially well in modern style gardens too in metallic planters - a great urban garden plant. The leaves are very fine and lace-like emerge each spring a lovely lime green, which deepens slightly over summer, Then in autumn, it turns the most amazing orange, a wonderful finale to it's growing season - falling dormant to repat it's virtuoso performance all over again year atter year. Reaching a maxmim of 7-8ft (2.2m) in 10 years, it's natural habit is slightly spreading, so has a large bonsai-like style of growth. Great for oriental inspired garden themes, and a real garden 'must-have' for low maintenance and style. Supplied as an established plant ina 13cm pot.